At the Constitution Museum, we’ve spent years combing seaman protection certificates, size rolls, prisoner of war records and other documents that tell us what sailors physically looked like. We now know the height, build, hair and eye color of many of Constitution’s sailors and Marines. But this is only one, unchangeable part of their appearance. To get a complete picture, we must ask what their clothes looked like. Sailors certainly put a great deal of effort into looking like seamen. Their clothes embodied the skills and knowledge of their profession, and signified that they were “part of the club.” Without his jacket and trousers, the sailor seemed to lose a little bit of himself. A recently discovered document gives us a glimpse of the ready-made “slop” clothing provided Constitution’s very first crew in 1798. Statement showing the quantity of clothing & Provisions forwarded from Philadelphia to Henry Jackson, Boston for the use of the Frigate Constitution, vizt. A Constitution seaman in cold weather or mustering dress. 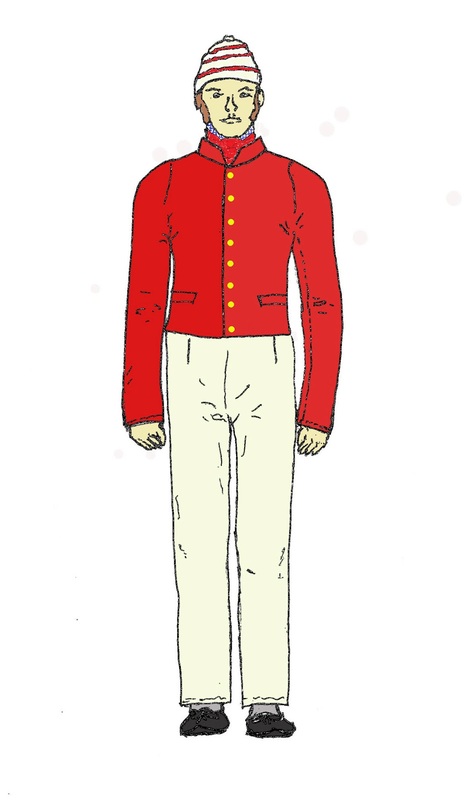 He wears a double-breasted woolen “monkey” jacket, blue woolen trousers, vest, wool-felt round hat, and pumps. Drawing by M. Brenckle. 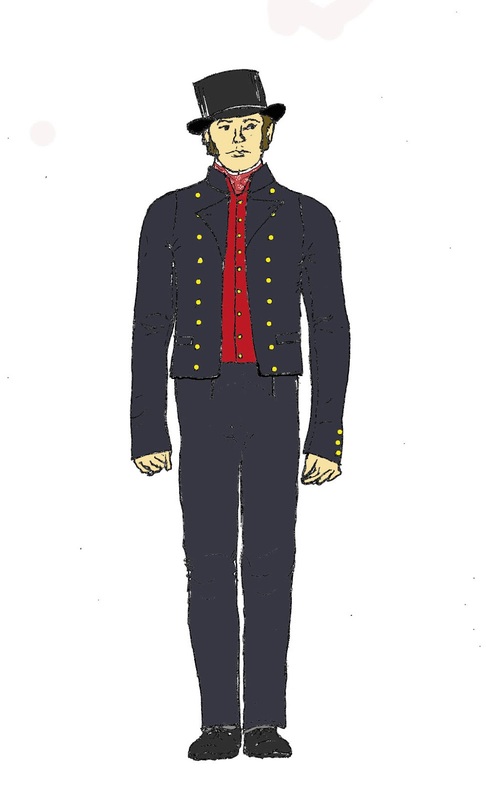 A Constitution sailor in “undress” or fatigue clothing. He wears a red woolen “under jacket with sleeves,” duck trousers, a spotted bandana handkerchief, check shirt, and knit cap based on numerous period images. Drawing by M. Brenckle. Cut high in the waist and loose in the leg, sailors’ blue woolen or white duck linen trousers afforded seasonal comfort and freedom of movement. Seamen wore white-spotted red cotton “bandanna” handkerchiefs around their necks, usually neatly tied with a square knot. Handkerchiefs came in “pieces” of twelve, so the ship received a total of 348. Wool flannel drawers provided an extra layer of warmth as well as acting as a barrier for “body soil.” The blue woolen “outside jackets” were probably double-breasted and short in the body. The under jacket or vest featured sleeves. Worn under the jacket in cold weather or alone in warm, it was a versatile garment. This list is not complete, however. It leaves out some essentials. It is unlikely that Constitution sailed with only these garments. We can fill in the gaps using the slop clothing requested for the frigate United States around the same time. Besides the jackets, vests, drawers , and trousers, the ship received 200 wool felt round hats, 300 check shirts, 200 pairs of shoes and pumps and 200 linen frocks, a sort of large overshirt designed to keep grime off the clothes worn below. Factoring in all of these items and comparing them to the pictorial record and original garments gives us a pretty good idea of the wearing apparel worn by the common seamen on Constitution and the other frigates in the closing years of the eighteenth century. Henry Jackson to William Dagget, 20 April 1798, Subject Files, Navy Records Collection, RG 45, NARA. “List of Sundries for the United States,” 12 July 1798, Subject Files, Navy Records Collection, RG 45, NARA.